This is it. 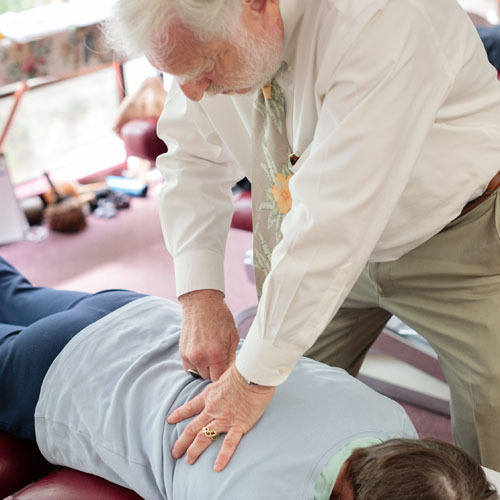 This is the one and only place to benefit from the Harte Method of Chiropractic. You benefit from my experience in practice, since 1981, with ongoing, seminars, dipping into the books, formulating new strategies, etc. The process never stops! The core of my method is Directional Non-Force Technique (DNFT), which employs gentle and highly specific adjustments, by hand, to correct subluxation at all levels of the spine, as well as the cranium, including the temporo-mandibular joint (TMJ), and extremities (knees, hips, shoulders, etc.) Each subluxated vertebra is adjusted in at least three planes of motion. When indicated, spinal disks are addressed, as well. The major differences between DNFT and other major techniques are (1) adjustments are gentle, suitable for newborns, and for those in their 90’s. (2) DNFT adjustments extremely specific, and they include dealing with disks, which are especially important for those with herniated or degenerated disks and/or stenosis. (3) DNFT goes beyond the spine, which is especially important for those who come in with “bone-on-bone” hips or knees, and those with TMJ problems, including some kinds of headaches, ringing in the ears and vertigo. (4) The analysis of what is subluxated (what has to be adjusted) and in what direction, is established every visit, which will be different from the visit before, because things are changing. When you go to a chiropractor and get the same, exact thing, every visit, nothing is changing. Usually, when people say, “I tried Chiropractic, but it didn’t work,” this was one of the problems. My own enhancements of DNFT include a great emphasis upon the upper cervical region (atlas and axis vertebrae, just below the skull) and the coccyx, at the very bottom of the spine. These are the three most important bones in the spine, as they are attached to the covering over the whole central nervous system, the meninges. Subluxation in these areas effects the whole system, the whole body. I adjust the upper cervical area utilizing either DNFT, Columbia or Upper Cervical Specific Technique, with my own modifications. The other technique by which I effect the tone of the whole system, through the sacrum, which is just above the coccyx, is Logan Basic Technique, again, with my modifications. Part of the Harte Method is Applied Kinesiology and Columbia Technique. Just recently, I have added one more tonal technique, Sacro-Occipital Technique. I work hard to bring my best to you, to help you to express more Life… physically, mentally and socially.